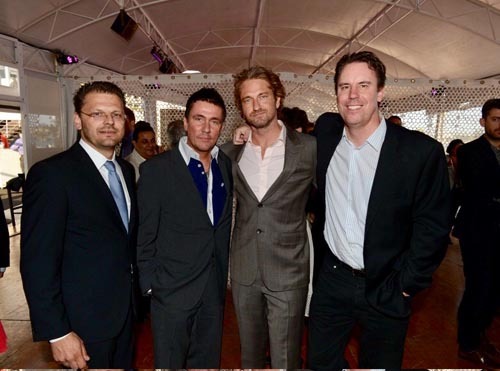 On May 19, 2012, at the Cannes Film Festival in France, West Coast Film Partners and Millennium Films announced they had signed a $150 million co-financing/co-production agreement. The agreement runs for three years plus extensions and calls for the parties to co-finance two to three wide-release feature films per year. The first movie West Coast will co-finance and co-produce is "Olympus Has Fallen," directed by Antoine Fuqua and starring Gerard Butler. It's an action movie about a U.S. Secret Service agent who has fallen from grace - until the White House is attacked and taken over by a team of North Koreans armed with extraordinary technology. Everything the Pentagon throws at the problem fails. But our hero knows the building like nobody else, and is the last chance we have to save, not only the President, but the entire country. The team will soon be announcing major co-star additions to the cast. The deal was put together by Millennium President Mark Gill and West Coast CEO Klay Shroedel. "We're very excited to be working with Klay and his team at West Coast," said Millennium Chairman Avi Lerner. "Clearly, they have financing expertise. But also the movies they want to make are very much in line with the direction we're taking our company today." "The team at Millennium impressed us with their commercial sensibilities and their willingness and ability to get movies made," Shroedel said. "At a time when so many companies in the film business are retrenching, these guys are expanding. We share their optimism about the potential for growth and success in the motion picture business, if properly managed, in the years ahead. I've known Mark Gill for quite some time, and we've been looking for the right projects that specifically fit the goals of WCFP and its investor partners. I am confident we have now found those projects and the right team to implement them. Millennium Films develops, finances, produces and distributes approximately 8-10 films per year. Among the company's upcoming movies are "The Expendables 2," "Playing The Field" directed by Gabriele Muccino and starring Gerard Butler, Uma Thurman, Jessica Biel, Catherine Zeta-Jones, Judy Greer and Dennis Quaid; and "The Paperboy" an official selection of the 2012 Cannes Film Festival directed by Lee Daniels and starring Matthew McConaughey, Zac Efron, John Cusack and Nicole Kidman. West Coast Film Partners is an equity fund and production company based in Germany, Great Britain and Los Angeles. The agreement was negotiated by Lerner and his partner Trevor Short along with Gill and business/legal affairs head Lonnie Ramati on behalf of Millennium, and by Shroedel, WCFP President Stefan Gray, and Gary Concoff of Troy Gould on behalf of West Coast.